Between the tiny PC phenomenon and the growing number of PCs shipping with Linux preloaded over the past year, there's been no shortage of hardware announcements for Linux fans. It's been a little less active on the tablet front, but just this week two separate announcements emerged about Linux tablets we've been waiting for. Here's a quick rundown on the basics. As I noted late last year, the PengPod surpassed its funding goal of $49,000 in its Indiegogo campaign, pulling in more than $72,000 instead. The project team didn't quite make the January shipping goal that was announced at the time, but preordered devices began shipping early this month, and new orders are expected to ship in late February, according to several posts on the PengPod blog. 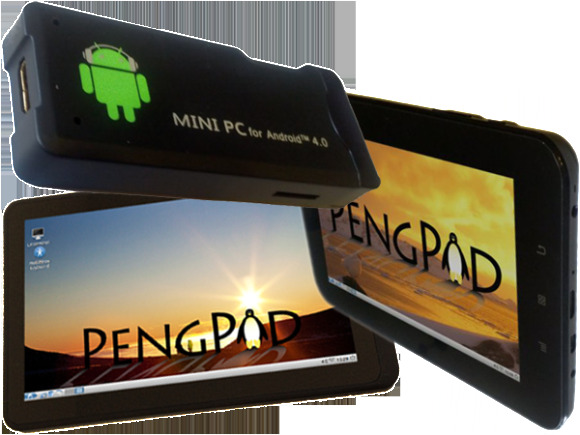 The PengPod line of “true Linux” devices includes 7- and 10-inch tablet models as well as a mini PC; all three feature the Allwinner A10 system on a chip. Included in the 7-inch PengPod700 tablet, priced at $120, is a capacitive touch screen, 1GB RAM, 8GB flash, speakers, and a front-facing camera. The 10-inch PengPod1000 comes with a higher-resolution display, with pricing of $185, while the $85 PengStick is a 3.5-inch mini PC with 1GB of RAM and 4GB flash storage that's similar to the MK802. Orders are now being accepted on the PengPod site. Reviews have been mixed so far. Then, too, there's the “Vivaldi” tablet, which has been appearing off and on in the news for quite some time now. First introduced under the name of “Spark” by KDE developer Aaron Seigo about a year ago, the planned device was renamed “Vivaldi” soon afterwards and also given more RAM. With target retail pricing of 200 euros, or about $267, the Vivaldi will be powered by Mer Core and KDE's Plasma Active. Specs are not yet set, but the latest schedule calls for the device to be ready in May, according to a Liliputing report, complete with a higher-resolution screen and a faster processor than what was originally planned. In the meantime, to learn more visit the MakePlayLive site.